The financier who plead guilty to 11 federal counts related to running his Ponzi scheme has left New York City. Bernard Madoff, aka prisoner no. 61727-054, shown here in his MCC mugshot. NEW YORK (CNNMoney.com) -- Madoff has left New York. 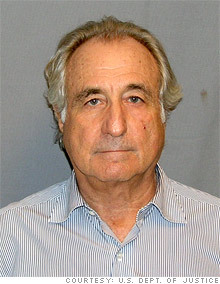 Bernard Madoff, otherwise known as prisoner no. 61727-054, has been incarcerated at the Metropolitan Correctional Center since March 12, when he pleaded guilty to 11 federal counts related to running his Ponzi scheme. "Mr. Madoff has left New York," said Judi Garrett, spokeswoman for Bureau of Prisons. She would not say where Madoff was headed or how he was getting there. Madoff, age 71, was sentenced to 150 years on June 29. His release date is Nov. 14, 2139. He is also being forced to forfeit property to comply with a $170 billion legal judgment against him. Before Madoff was sentenced, many of the thousands victimized in his scam wrote letters to Judge Denny Chin of U.S. District Court in Manhattan, describing how they were financially ruined by his scheme and requesting life in prison for the Ponzi mastermind. Madoff's lawyer Ira Lee Sorkin requested to the judge that Madoff be sent to Federal Correctional Institution Otisville. The medium-security prison is located about 70 miles northwest of New York City, where Madoff lived in a $7 million apartment before admitting to the scheme on March 12. The judge said that he would recommend that Madoff be transferred to a prison in the northeast, but he did not say where. The Bureau has the final say in deciding where Madoff will live. FCI Otisville is a medium security prison with an adjoining prison camp, a textile factory, a full-time rabbi and "one of the largest and most active religious programs for Jewish inmates in the Bureau of Prisons," according to Alan Ellis, a prison consultant and author of the "Federal Prison Guidebook." Madoff's wife Ruth has also left the $7 million apartment, and has been allowed to keep $2.5 million which has not been connected to the Ponzi scheme. -- CNNMoney staff writer Catherine Clifford contributed to this report.